Pentâge Winery, located in Penticton, B.C., is a smaller winery overlooking Skaha Lake in the Okanagan. Paul Gardner & Julie Rennie started Pentâge back in 1996. This winery’s focus is on reflecting the terroir of the vineyard, and ensuring that their low-yield cropping strategy produces the best quality, hand-crafted wines. 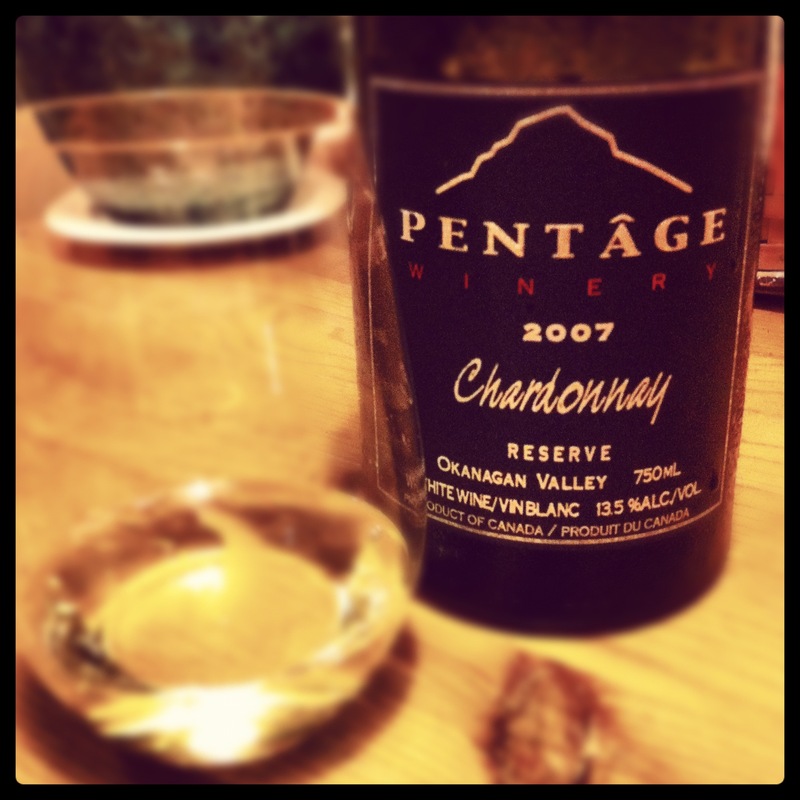 Pentâge Winery got its name for a special reason. Penta, meaning “5” in Greek, is the root of their winery name, but also their well-known red blend, called “Pentâge”, of five estate-grown varietals. Merlot, Gamay, Syrah, Cabernet Sauvignon, and Cabernet Franc are all harvested, aged, and then blended each year in differing volumes to reflect the most palatable blend according to that vintage’s harvest. I sort of like it when a winemaker takes enough pride in his/her product to recreate and revitalize a tradition. Bravo! After seeing an attractive sounding blurb about this Chardonnay of theirs in the Swirl email I get on a weekly basis, I couldn’t wait to get my hands on a bottle. I kept it for about 10 months or so, and finally decided that I was going to open this Reserve Chardonnay that I had so badly wanted to purchase. For a 5 year old BC white wine, it was holding nicely. Sitting at 13.5% abv, the alcohol was not hot or flat. This Chardonnay had already begun taking on golden hues; as the rules go, white wines tend to deepen their colour intensity with age, whereas reds tend to fade. The initial whiffs on the bouquet revealed oak. It was not overpowering or intrusive, but a nice toasted wood scent alongside hints of vanilla, citrus, tropical fruits, peach skins, melon, and a hint — just a hint — of butter. The bouquet on this wine was intoxicating. It was definitely one of those times where it took me so long to actually have a sip, because I was enraptured by what my nose was capturing! On the palate, the high acid, medium intensity, and medium bodied wine showed good balance and confidence. Sweet vanilla toast, lemon juice, peach and butter all came forward to play. For optimal quality, drink it right away. While this charismatic Chardonnay is drinking beautifully, I would not want to age it much more. This is a Reserve you do not want to miss. Waiting might be a deal with the devil. Drink now, and ensure you finish the bottle, as it didn’t last overnight even with the oxygen sucked out of the bottle. That is not an issue though, right? Available in special wine & liquor stores for under $30.